In accordance with Directive 2000/53/EC of the European Parliament and of the Council of 18 September 2000 on end-of-life vehicles (3), appropriate provisions should be laid down to ensure that type-approved vehicles belonging to category M1, and those belonging to category N1, may be put on the market only if they are reusable and/or recyclable to a minimum of 85 % by mass and are reusable and/or recoverable to a minimum of 95 % by mass. Reusability of component parts, recyclability and recoverability of materials constitute a substantial part of the Community strategy for waste management. Therefore vehicle manufacturers and their suppliers should be requested to include those aspects at the earliest stages of the development of new vehicles, in order to facilitate the treatment of vehicles at the time when they reach the end of their life. This Directive constitutes one of the separate directives within the framework of the Community whole vehicle type-approval system established by Council Directive 70/156/EEC of 6 February 1970 on the approximation of the laws of the Member States relating to the type-approval of motor vehicles and their trailers (4). That whole vehicle type-approval system is currently compulsory for vehicles belonging to category M1 and will be extended, in the near future, to all categories of vehicle. It is therefore necessary to include in the whole vehicle type-approval system those measures concerning the re-usability, recyclability and recoverability of vehicles. Accordingly, it is necessary to lay down provisions to take into account the fact that N1 vehicles are not yet covered by the whole vehicle type-approval system. The manufacturer should make available to the approval authority all relevant technical information as regards constituent materials and their respective masses in order to permit verification of the manufacturer's calculations in accordance with the standard ISO 22628: 2002. The manufacturer's calculations can be properly validated at the time of the vehicle type-approval only if the manufacturer has put in place satisfactory arrangements and procedures to manage all information he receives from his suppliers. Before any type-approval can be granted, the competent body should carry out a preliminary assessment of those arrangements and procedures and should issue a certificate indicating that they are satisfactory. The relevance of the different inputs in the calculations of the recyclability and recoverability rates has to be assessed in accordance with the processes for treatment of end-of-life vehicles. The manufacturer should therefore recommend a strategy for the treatment of end-of-life vehicles and should provide details thereof to the competent body. This strategy should be based on proven technologies, which are available or in development at the time of applying for the vehicle approval. Special-purpose vehicles are designed to perform a specific function and require special bodywork arrangements which are not entirely under the control of the manufacturer. Consequently, the recyclability and recoverability rates cannot be calculated properly. Those vehicles should therefore be excluded from the requirements concerning calculation. Incomplete vehicles constitute a significant proportion of N1 vehicles. The manufacturer of the base vehicle is not in a position to calculate the recyclability and recoverability rates for completed vehicles because the data concerning the later stages of construction are not available at the design stage of the base vehicles. It is therefore appropriate to require only the base vehicle to comply with this Directive. The market shares of vehicles produced in small series are very limited, so that there will be little benefit to the environment if they have to comply with this Directive. It is therefore appropriate to exclude them from certain provisions of this Directive. In accordance with Directive 2000/53/EC, appropriate measures should be taken, in the interests of road safety and protection of the environment, to prevent the reuse of certain component parts which have been removed from end-of-life vehicles. Such measures should be restricted to the reuse of parts in the construction of new vehicles. The provisions set out in this Directive will impose on manufacturers the supply of new data relating to type-approval and therefore these particulars should be reflected in Directive 70/156/EEC, which establishes the exhaustive list of data to be submitted for type-approval. It is therefore necessary to amend that Directive accordingly. The measures necessary for the adaptation to scientific and technical progress of this Directive should be adopted in accordance with the regulatory procedure provided for in Article 13(3) of Directive 70/156/EEC. Since the objective of this Directive, namely to minimise the impact of end-of-life vehicles on the environment by requiring that vehicles be designed from the conception phase with a view to facilitating reuse, recycling and recovery, cannot be sufficiently achieved by the Member States acting alone and can, therefore, by reason of the scale of the action, be better achieved at Community level, the Community may adopt measures, in accordance with the principle of subsidiarity as set out in Article 5 of the Treaty. In accordance with the principle of proportionality, as set out in that Article, this Directive does not go beyond what is necessary in order to achieve this objective. This Directive lays down the administrative and technical provisions for the type-approval of vehicles covered by Article 2, with a view to ensuring that their component parts and materials can be reused, recycled and recovered in the minimum percentages set out in Annex I. It lays down specific provisions to ensure that the re-use of component parts does not give rise to safety or environmental hazards. This Directive shall apply to vehicles belonging to categories M1 and N1, as defined in Part A of Annex II to Directive 70/156/EEC, and to new or reused component parts of such vehicles. vehicles produced in small series, referred to in Article 8(2)(a) of Directive 70/156/EEC. ‘competent body’ means an entity, e.g. a technical service or another existing body, notified by a Member State to carry out preliminary assessment of the manufacturer and to issue a certificate of compliance, in accordance with the prescriptions of this Directive. The competent body may be the type-approval authority, provided its competence in this field is properly documented. 1. Member States shall grant, as appropriate, EC type-approval or national type-approval, with regard to reusability, recyclability and recoverability, only to such vehicle types that satisfy the requirements of this Directive. 2. 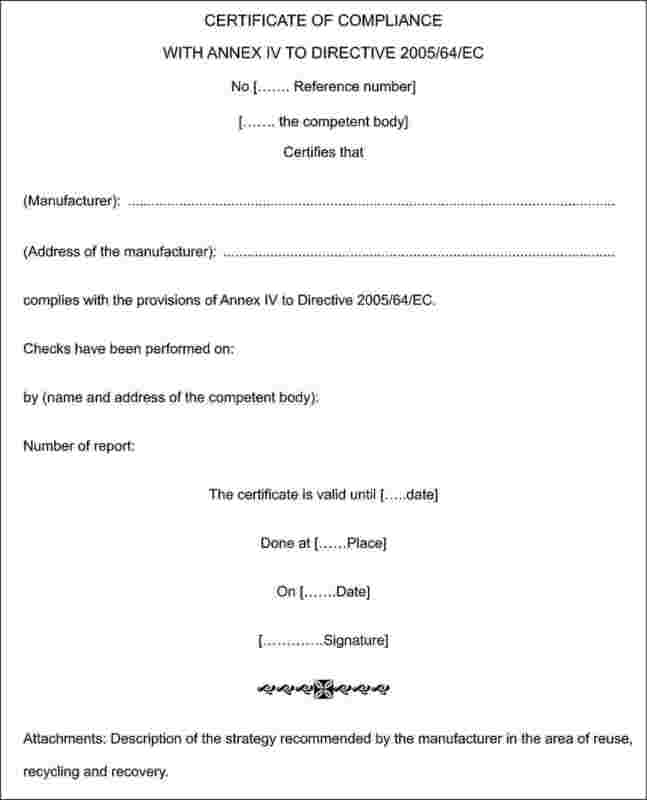 For the application of paragraph 1, the manufacturer shall make available to the approval authority the detailed technical information necessary for the purposes of the calculations and checks referred to in Annex I, relating to the nature of the materials used in the construction of the vehicle and its component parts. In cases where such information is shown to be covered by intellectual property rights or to constitute specific know-how of the manufacturer or of his suppliers, the manufacturer or his suppliers shall supply sufficient information to enable those calculations to be made properly. 3. With regard to reusability, recyclability and recoverability, the Member States shall ensure that the manufacturer uses the model of the information document set out in Annex II to this Directive, when submitting an application for EC vehicle type-approval, pursuant to Article 3(1) of Directive 70/156/EEC. 4. When granting an EC type-approval pursuant to Article 4(3) of Directive 70/156/EEC, the type-approval authority shall use the model of the EC type-approval certificate set out in Annex III to this Directive. 1. Member States shall not grant any type approval without first ensuring that the manufacturer has put in place satisfactory arrangements and procedures, in accordance with point 3 of Annex IV, to manage properly the reusability, recyclability and recoverability aspects covered by this Directive. When this preliminary assessment has been carried out, a certificate named ‘Certificate of Compliance with Annex IV’ (hereinafter the certificate of compliance) shall be granted to the manufacturer. 2. In the framework of the preliminary assessment of the manufacturer, Member States shall ensure that the materials used for the construction of a vehicle type comply with the provisions of Article 4(2)(a) of Directive 2000/53/EC. The Commission shall, in accordance with the procedure referred to in Article 9, establish the detailed rules necessary to verify compliance with this provision. 3. For the purpose of paragraph 1, the manufacturer shall recommend a strategy to ensure dismantling, reuse of component parts, recycling and recovery of materials. The strategy shall take into account the proven technologies available or in development at the time of the application for a vehicle type-approval. 4. Member States shall appoint a competent body, in accordance with point 2 of Annex IV, to carry out the preliminary assessment of the manufacturer and to issue the certificate of compliance. 5. The certificate of compliance shall include the appropriate documentation and describe the strategy recommended by the manufacturer. The competent body shall use the model set out in the Appendix to Annex IV. 6. The certificate of compliance shall remain valid for no less than two years from the date of deliverance of the certificate before new checks shall be conducted. 7. The manufacturer shall inform the competent body of any significant change that could affect the relevance of the certificate of compliance. After consultation with the manufacturer, the competent body shall decide whether new checks are necessary. 8. At the end of the period of validity of the certificate of compliance, the competent body shall, as appropriate, issue a new certificate of compliance or extend its validity for a further period of two years. The competent body shall issue a new certificate in cases where significant changes have been brought to the attention of the competent body. not be reused in the construction of vehicles covered by Directive 70/156/EEC. Directive 70/156/EEC shall be amended in accordance with Annex VI to this Directive. Amendments to this Directive which are necessary to adapt it to scientific and technical progress shall be adopted by the Commission in accordance with the regulatory procedure referred to in Article 13(3) of Directive 70/156/EEC. prohibit the registration, sale or entry into service of new vehicles. refuse to grant national type-approval. refuse the registration, sale or entry into service of new vehicles, save where Article 8(2)(b) of Directive 70/156/EEC applies. 4. Article 7 shall apply with effect from 15 December 2006. 1. Member States shall adopt and publish, not later than 15 December 2006, the laws, regulations and administrative provisions necessary to comply with this Directive. They shall forthwith communicate to the Commission the text of those measures. They shall apply those measures from 15 December 2006. (1) OJ C 74, 23.3.2005, p. 15. (2) Opinion of the European Parliament of 14 April 2005 (not yet published in the Official Journal) and Council Decision of 6 October 2005. (3) OJ L 269, 21.10.2000, p. 34. Directive as last amended by Council Decision 2005/673/EC (OJ L 254, 30.9.2005, p. 69). (4) OJ L 42, 23.2.1970, p. 1. Directive as last amended by Commission Directive 2005/49/EC (OJ L 194, 26.7.2005, p. 12). as determined by the procedures laid down in this Annex. For the purposes of type-approval, the manufacturer shall submit a data presentation form duly completed, established in accordance with Annex A to the standard ISO 22628: 2002. It shall include the materials breakdown. It shall be accompanied by a listing of the dismantled component parts, declared by the manufacturer with respect to the dismantling stage, and the process he recommends for their treatment. For the application of points 1 and 2, the manufacturer shall demonstrate to the satisfaction of the approval authority that the reference vehicles meet the requirements. The calculation method prescribed in Annex B to the standard ISO 22628: 2002 shall apply. However, the manufacturer must be in a position to demonstrate that any version within the vehicle type complies with the requirements of this Directive. the available optional equipment (1) which can be fitted under the manufacturer's responsibility. each ‘type of bodywork’, i.e. van, chassis-cab, pick-up, etc., in the case of N1 vehicles. For the purposes of calculations, tyres shall be considered as recyclable. if the figure following the decimal point is between 5 and 9, the total is rounded up. For the purposes of checking the calculations referred to in this Annex, the approval authority shall ensure that the data presentation form referred to in point 2 is coherent with the recommended strategy annexed to the certificate of compliance referred to in Article 6(1) of this Directive. For the purposes of checks of the materials and masses of component parts, the manufacturer shall make available vehicles and component parts as deemed necessary by the type-approval authority. (1) i.e. leather upholstery, in-car radio equipment, air-conditioning, alloy wheels, etc. (2) If not available at the time of granting the EC type-approval, this item shall be completed at the latest when the vehicle is introduced on the market. (3) As defined in part A of Annex II to Directive 70/156/EEC. This Annex describes the preliminary assessment that must be carried out by the competent body to ensure that the manufacturer has put in place the necessary arrangements and procedures. The competent body shall comply with standard EN 45012: 1989 or ISO/IEC Guide 62: 1996 on the general criteria for certification bodies operating quality system certification as regards the management systems implemented by the manufacturer. verify that no component part listed in Annex V is reused in the construction of new vehicles. 3.2. The manufacturer shall provide the competent body with all relevant information, in documentary form. In particular, recycling and recovery of materials shall be properly documented. (1) OJ L 53, 28.2.2003, p. 58. This Annex addresses the component parts of vehicles belonging to category M1 and those belonging to category N1 which must not be reused in the construction of new vehicles. (1) When the airbag is inserted inside the steering wheel, the steering wheel itself.